I first visited Hare and Tortoise long before Ramen Resolution become my thing. In fact, long before I even really knew that ramen could be more than the little packets of salty ‘chicken’ noodles at all. On my last visit, which I think would have been in 2012, I had a Katsu curry. I remember it being tasty, but as it’s been five years, it clearly wasn’t somewhere I was clamouring to return to. I didn’t get to see much of this summer due to a variety of work things, but obviously there was time for some noodles here and there! One of the warm evenings we took a stroll from Adam’s swanky crash pad to the Blackfriars branch of Hare and Tortoise. We were early and there was only one other family in there. We were outnumbered by staff by a ration of what felt like 12:1. I always find that a bit awkward. 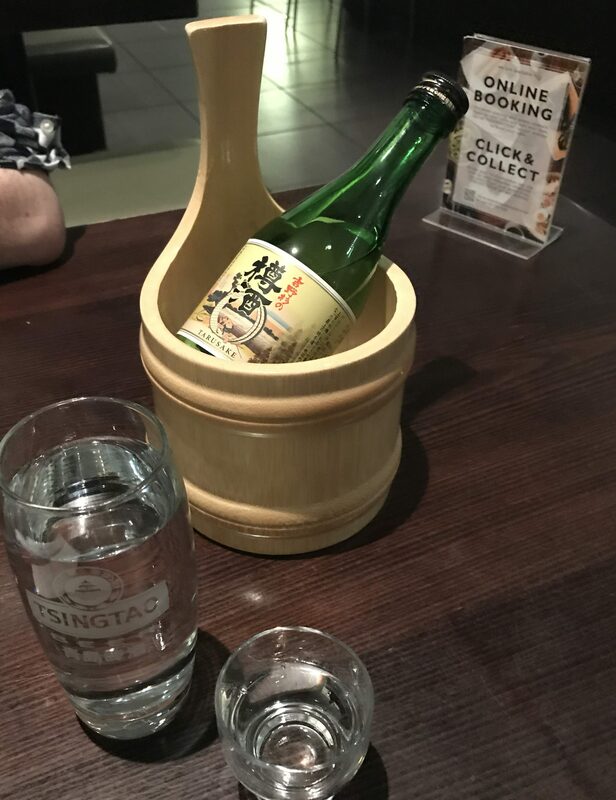 The situation was improved when the sake arrived – unusually in a small bottle rather than a carafe. We ordered our food. Hare and Tortoise seems more of a ‘typical Japanese’. It sells more than just ramen, and specialises in sushi and sashimi. I’m a fan of both, but that is not what RamenRevolution was all about! Our katsu prawns and ramen arrived simultaneously. The downside of this is that the broth keeps on cooking the noodles so once you get to them they were a bit too soft. I opted for the Tantanmen ramen which had the added ingredient o peanut paste. This gave it a good mouthfeel, but part of me felt it was a shortcut rather than the long-boil broths which achieve the same effect. Watch out, here comes the science…I discovered that the silken broths get that when the collagen in the animal bones starts to breakdown. I warned you, once you know the science it suddenly seems less delicious. Overall Id say Hare and Tortoise was ok, but I think you can get better ramen, cheaper and in less formal surroundings. 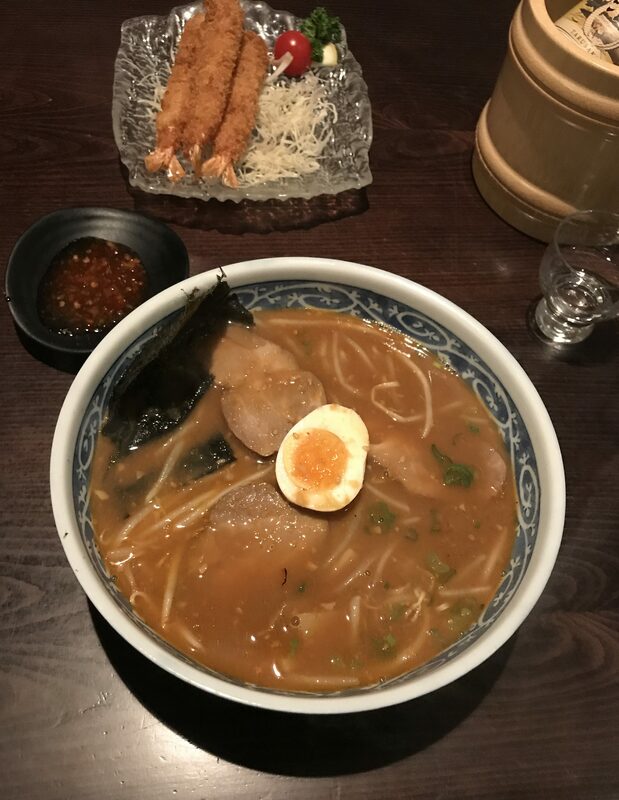 They might not be factors that you’re looking for, but ramen is essentially street food and I’m wary of places which try and pretend otherwise. I give them a RAMEN (2 out of 5) which is my lowest score so far. It might be great for other things but in the ramen race both the Hare and Tortoise are trailing behind others. Yes, I did just weave in an Aesop’s fable reference. That’s how I roll!